As I previously mentioned last week - I have very few photos from prior to 2004. Unfortunately my family didn't take very many photos as we were growing up. However, there are a couple gems I've found over the years. Here I am, circa 1982 at 4 years old. 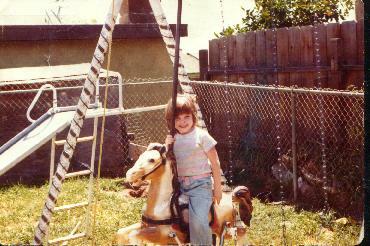 I loved riding this horse. Truly a Flashback Friday, eh? Awesome! This is definitely a flashback!! You know I am the same, I grew up in over 25 foster homes and prior to that my parents were addicts among-st other things so I think I too only have a handful of photos of myself before I became a mum. I'll share them more as we go!! Great shot too, very cute! Hi Huda! Thanks for following me! I'm following you now too. oh that's so awesome!! I am trying to find some OLDies of myself too, will probably have to get my moms scrap book & scan it! That's a beauty. Treasure it, and the memory. I definitely treasure the few pictures from my childhood I have - as well as the memories! Thank you Helen for stopping by and taking the time to leave a comment!